What do you do when you've just broken up one of the most influential power pop bands of all time, The Raspberries? If you are singer/songwriter Eric Carmen, you sign a deal with Arista Records and release an album the combines the Beach Boys with the works of the finest romantic classical composers of the early 20th century. I bet you didn't think that would be the answer. Carmen dropped the rough and ready guitars, and the Beatles influences of his former band, and plunged right into well-coiffed blown dry hair, shirt unbuttoned down to the navel and became the epitome of Mr. Sensitive Self-Pity. Not that this was a bad thing for this debut album, taken on its own terms. Pairing up with Raspberries producer Jimmy Ienner, Carmen laid on the Beach Boys harmonies really heavy as well as the chamber reverb, and instead of coming up with a few of his own tunes, did the time honored rock music tradition of ripping off classical music in the public domain, taking all the songwriting credit without mentioning the dead composers he took from. Yes, that tradition goes back to The Toys' "A Lover's Concerto" (Bach) and Barry Manilow's "Could It Be Magic" (Chopin). For some reason, I think The Four Seasons' "Opus 17" should be part of this list too, but I'm not sure. The smash ballad "All By Myself" was undeniably catchy despite the pomposity that went along with Carmen's depressing lyrics ("Livin' alone/I think of all the friends I've known/When I dial the telephone/Nobody's home"). I mean, just take a gun and shoot yourself, man! The drums come slamming in on the second verse ("Hard to be sure..."). The epic's centerpiece, which you will miss if you hear the 45 version, is a three or four minute recreation of Sergei Rachmaninoff's Piano Concerto in C# minor, a very dramatic piano interlude accompanied by orchestra. The song became a standard, even performed by contestants on "American Idol." And it can't entirely be a surprise that schlockstress Celine Dion covered this song too. But Carmen didn't stop with the classics there. His other big hit single from the album, "Never Gonna Fall In Love Again"came right off the same classical composer's Symphony No. 2, continuing Carmen's bleak lyrics smothered in harmonies and orchestra. One of the better rock songs off the album, "That's Rock and Roll," became a big hit for teen star Shaun Cassidy. Now I have to admit -- I do like these songs, even if I didn't realize Carmen borrowed from Rachmaninoff until at least dozen years later, as I'm sure many others didn't either. The melodies were lush and powerful, despite the downer words, and I kind of dug the big "piano statement" in the middle of "All By Myself." In the mid 70's, before the arrival of punk and while disco was on its way up, certain sappy music had its appeal, I'm not denying it. My favorite from the album, though, is the opener "Sunrise," which fades in slowly with strings and then bursts right into an upbeat Brian Wilson-type song full of quarter time piano chords, jangly Christmas bells, many overdubbed background vocals, and finally a searing guitar solo at the end accompanied by pumping horns. It's the perfect sunshine-y opener for the epics to come. 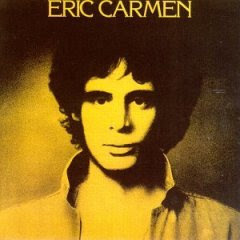 As far as the bummer lyrics go, "Eric Carmen" paled in comparison to his second solo album, Boats Against The Current, which should have come with its own suicide prevention line. Below are two videos: the first from the English show "UK Gold," where Carmen performs "All By Myself, does a small part of the middle Rachmaninoff section, and is surrounded by swaying teens! The second is an absolutely horrid homemade montage to "Never Gonna Fall In Love Again," but this one is definitely for the music, not the visuals. You're not being fair to Carmen here, and part of the reason is you don't have your facts straight. The bridge piano solo in "All By Myself" is Carmen's--he wrote it. Really. Didn't swipe it from anyone else. One more thing: None of Rachmaninoff's music is "in the public domain," as you claim. Carmen found this out later when Rachmaninoff's estate and heirs went after him for royalties based on the sales of "All By Myself." Current recordings of the song credit "Eric Carmen and Sergei Rachmaninoff" as songwriters and part of the royalties go to Rachmaninoff's estate. Guess you're not a Carmen fan, either. Too bad.